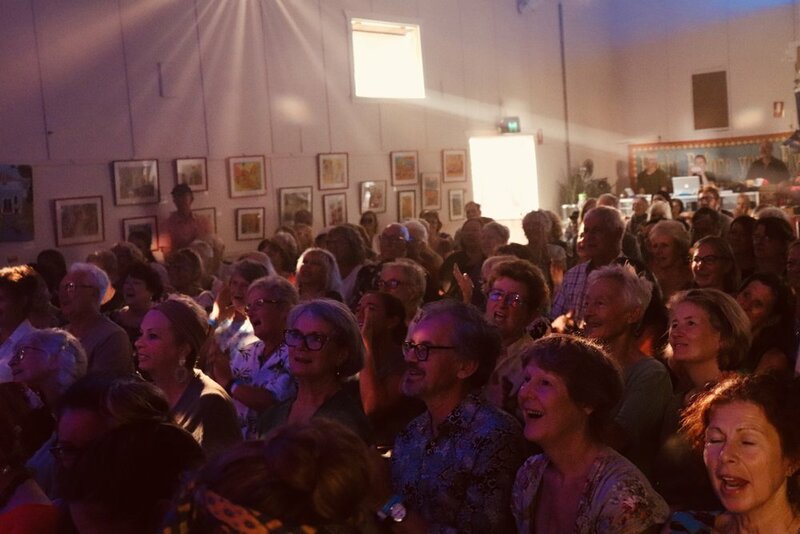 We planned a lovely afternoon of a garden party High Tea (supplied by the CWA ladies), with the Lismore Levee Brass Band playing on a raised platform in the lovely Picture House Garden followed by a concert inside by The Loveys themselves!! This was our plan- but the skies had another plan for us! As it deluged outside we moved everything inside - the whole audience, a brass band and some delightful CWA home- made food!! As we prepared in the green room we could hear loud singing by a very forgiving audience - the stage was set for our first half - dressed in green tones to honour St Paddy’s Day- (we noticed some of our audience dressed in similar colours!). So the concert progressed with such fun and sensitivity to the humour and wistfulness we seem to take audiences through. Another small taste of the brass band at interval while we changed into our leopard look- how fun it is to be dressing up in all sorts of crazy, elegant clothes. Another gorgeous experience for us all - we love our audiences! !